The Home Depot is helping people do more with their hard earned money. From modest projects like updating your bath to small projects with a big impact like paint, The Home Depot can help you get more done in your home for less. That's the power of the world's largest home improvement retailer. The Home Depot. More saving. More doing. Gift cards may be redeemed at any The Home Depot stores and online. They never expire and no service fees will ever be charged when purchasing or using The Home Depot Canada gift cards. 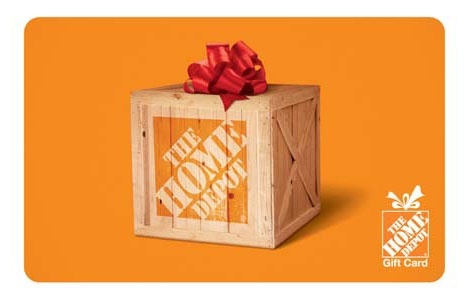 Order your bulk Home Depot Canada gift cards from NGC Canada today! Valid toward purchase of merchandise/services at any The Home Depot® store in the U.S., Canada and online at HomeDepot.com. Gift Card carries no implied warranties and is not a credit/debit card. Not redeemable for cash (unless required by law) and cannot be applied to any credit or loan balance, Tool Rental deposits, or for in-home/phone purchases. Gift Cards will not be cancelled and replaced without proof of purchase. Except as required by law, Gift Cards purchased with cash will not be replaced and any Gift Card may be deactivated or rejected in connection with fraudulent actions. Check your balance at any The Home Depot store or online. Reload card value at any The Home Depot store. NGC is not affiliated with The Home Depot. The Home Depot is not a sponsor of this program. The Home Depot is a registered trademark of Homer TLC, Inc.